"What happens if you put two young artists together to collaborate? The second duo that shows their result are Marta and Inge. Enjoy their work with some drinks at the opening on May 4th at Pink House, Antwerp." From January till May, the participants of DOI Creative Lab are showing at Kavka. It's a nice opportunity to see how they work as individuals before we show you their creative minds in duo. In this last part of the take over it's Inge's turn. Her work will be on display from 11th untill 31st of May. Opening: Thursday, 18th of May. Weekly, from mid-January until the end of March, the Foto Masters at the Royal Academy of Fine Arts Antwerp will open an original show for [x] One Night Only. Open from 7 - 9PM. 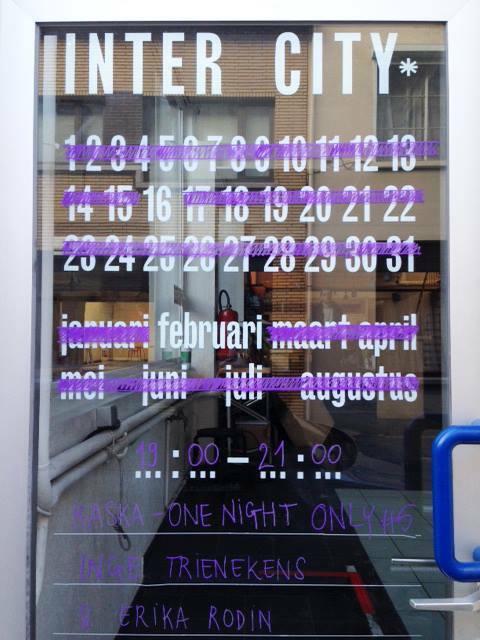 Every THURSDAY at EXTRA CITY a new exhibition. That's 17 artists in 10 weeks. In November 2016 one of my teachers and some of my classmates went on an exchange to the Guangzhou Academy of Fine Art in China, where we participated in a workshop with the students from GAFA in China and the students from KASKA in Belgium at the same time. My work will be shown at LAC Studios in Eindhoven from the 12th until the 19th of November. Als klein meisje was ik bang voor het donker. Toen ik begon met reizen over de wereld, werd ik eraan herinnerd dat er een mogelijkheid was om aan de nacht te ontsnappen. De hoeveelheid kunstlicht op aarde maakt het verschil tussen dag en nacht steeds minder groot. Het gevolg hiervan is dat de sterrenhemel minder zichtbaar wordt op onze planeet, is er zoveel lichtvervuiling dat het op weinig plekken nog maar echt donker is. De sterrenhemel is iets wat me fascineert, het is lichtjaren van ons verwijderd en de meesten sterren die wij kunnen zien bestaan niet meer. Voor dit project ben ik op zoek gegaan naar de kunstmatige sterrenhemel in de stad. Photoworks asked me to do an interview with them for this topic called; Ideas on Talent. They approached me after they had seen my name as a longlist candidate for the ING Unseen Talent Award 2016. Very happy to announce I am nominated for the Foederer Talent Award 2016. Working on my project right now, this will be exhibited in a group exhibition during GLOW in Eindhoven from the 12th until the 19th of November. More information coming very soon!!! MY WORK; NATURE NURTURE, PUBLISHED ON THE BEAUTIFUL ONLINE CUCKOO MAGAZINE. DUBLIN, IRELAND.